Norwegian is proud to announce that British author Jane Austen has taken to the skies as her portrait adorns the tail fin of a Norwegian Boeing 787 Dreamliner aircraft. The world-renowned author inspired generations with her best-known works including Sense & Sensibility, Pride & Prejudice and Emma. The Jane Austen tail fin Dreamliner aircraft operates Norwegian’s long-haul routes from London Gatwick including the airlines 12 nonstop routes to the USA and flights to Singapore and Buenos Aires. To reflect Norwegian’s rapid growth in the UK, where it now flies 5.8 million UK passengers each year to more than 50 destinations, the airline has launched a series of UK tail fin heroes. 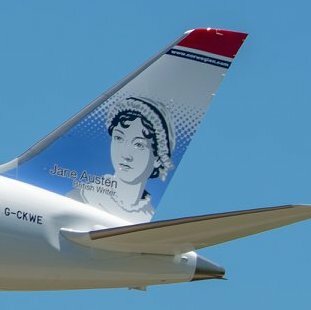 Jane Austen has become Norwegian’s eighth UK tail fin hero following the announcement of children’s author Roald Dahl, footballer Bobby Moore, pioneering pilot Amy Johnson, rock legend Freddie Mercury, aviation maverick Sir Freddie Laker, poet Robert Burns and explorer Sir Ernest Shackleton. Jane Austen, one of the world’s most famous authors, born on 16th December 1775, spent most of her life in the historic and beautiful county of Hampshire. Its houses, countryside and people provided the inspiration for many of her novels. It was during her time in the quiet village of Chawton that she wrote and revised six of her most famous novels – Sense & Sensibility, Pride & Prejudice and Northanger Abbey, and wrote Mansfield Park, Emma and Persuasion. It wasn’t until 1810 that her first novel Sense & Sensibility was accepted for publishing by Thomas Egerton. Europe’s third largest low-cost carrier flew 5.8 million passengers from the UK to over 50 global destinations. The airline has one of the youngest aircraft fleets in the world with an average age of 3.7 years, with more than 150 new aircraft on order. Norwegian has been awarded the ‘World’s best low-cost long-haul airline’ for four consecutive years at the SkyTrax World Airline Awards.